After two years of daily measuring, monitoring, feeding, and harvesting, three researchers felt like they’d reached an understanding of how their aquaponics facility really worked. With a new study, “Energy and water use of a small-scale raft aquaponics system in Baltimore, Maryland, United States,” the authors describe the relationship between inputs (energy, water, and fish feed), outputs (edible crops and fish), and operating conditions for their Baltimore-based facility. Basically, authors Dave Love, Michael Uhl and Laura Genello asked, What resources does it take to maintain an aquaponics facility and how could the system be optimized for profit? Aquaponics is a form of aquaculture (fish farming) that integrates hydroponics (soilless plant farming) to symbiotically raise plants and fish for consumption. Other researchers have conducted business analyses and plot studies, but this is the first study to show how the cost of resources used in aquaponics is translated into commercial products. Looking at the energy costs versus sales, they found that plants were profitable but fish were not. Compared to crops, fish required roughly three times more water, feed, and energy per month to produce 1kg of product. Dave Love points out two caveats in that both our climate zone (USDA plant hardiness zone 7) and small-scale nature of our facility may contribute to this dynamic. A related study suggests that aquaponics facilities located in warmer climates (zones 7 or above) were four times as likely to be profitable as those in colder climates. The take-away? Heating costs could play a major role in profitability. A similar study conducted by the University of Hawaii underscored the role of warmer climates, and by contributing the going rate for their tilapia, connections between the two studies could be made to show how the market also affects profitability. For example, the market price for tilapia in Maryland was $8.82/kg, versus $11.02/kg in Hawaii. Not only were the energy costs to produce tilapia much lower in Hawaii ($1.70/kg vs. $12/kg in Maryland), the price for tilapia was higher, which helps explain how fish could be more profitable than crops in a different setting. Factors such as markets, production scale, and start-up and recurring input costs need to be carefully considered when planning an aquaponics business to avoid pitfalls and maximize one’s chance for success. Love admits, “We have no idea how these results would generalize to larger scales,” but he hopes the research can serve as a point of comparison for similar small-scale facilities, future life-cycle/systems-level assessments, and help inform farm business plans. 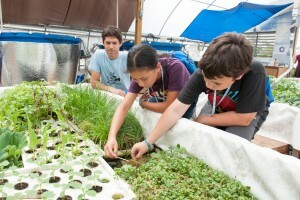 When asked if there were any changes being made to the Johns Hopkins Center for a Livable Future aquaponics facility as a result of the paper, he indicated that rainwater collection was the most obvious answer to improve the operation’s sustainability, and steps are being taken to utilize that resource. Take advantage of rainwater—natural rainwater collection would have provided enough to completely offset the water needs of this facility(!). Solar power—during some periods in the summer, solar energy could greatly reduce energy needs. Solar thermal water heaters are one tool to reduce energy demands. Structural efficiency—be thoughtful of energy needs when constructing the building and components. This facility could reduce heat loss by using more effective tank insulation and lid enclosures and insulating the hoophouse more effectively. They also considered how removing shady trees and orienting the building differently could optimize the use of energy. Heat recovery—the use of heat recovery hot water heaters (ex. from ice makers and refrigerators) could provide heat at a cheaper rate than propane. For this facility, in-tank water heaters required the most energy. Row covers—could be used to protect plants from frost during winter nights (to reduce winter air heating needs), and could also trap heat from the water under the cover to further reduce air heating needs. Choose plants wisely—for example, hardy winter greens can often grow without supplemental heating during the cold months in Maryland. Choose fish wisely—depending on the climate, raising species that can survive at lower water temperatures could require less heating. Also, choosing to raise higher-value species to increase the market price may be another selection strategy. Fish waste solids—can be collected by geotextile bags and composted, which can be used as fertilizer for external plants and potentially another source of revenue. Sell at farmers markets—farmers selling at these outlets often receive higher prices when selling direct-to-consumers; plus, hydroponic and USDA organic produce often fetch a higher price than conventional products. Aquaponics is still in its early stages, but the pieces are coming together to better inform those who are interested in the practice, and Love is happy to provide the data sets from this study by email. If you’re involved in aquaponics and want to join the conversation, we’d love to hear about your experience. The Food Systems Lab at Cylburn is about to become even better! Please watch our Facebook page for updates on exciting new additions to our greenhouse. We’re open every Wednesday from 10 a.m. to noon for individual visitors, or contact Laura Genello to schedule a tour for your group. The project is located at 4915 Greenspring Avenue in Baltimore. How Free is Your Produce?